​all special events take place on the Square (2 Public Square, Medina, OH 44256) or in the Historic District unless otherwise noted. Join us in the District the first Friday of every month for an evening of shopping, dining, live music, pop-up art shows and performances, and themed celebrations. Most stores are open until 8pm. The much-loved celebration of all things frozen, also known as the Medina Ice Festival, will take place on the Medina Square February 15-18, 2019. Now in its 25th year, the festival, produced and run by Elegant Ice Creations, will showcase nearly 100+ ice sculptures sponsored by local businesses, on view throughout the four-day festival. Major sponsors include Main Street Medina, The City of Medina, Excalibur Auto Body, and Elegant Ice Creations. The event takes place rain or shine, and all carvings are left on view throughout the weekend. 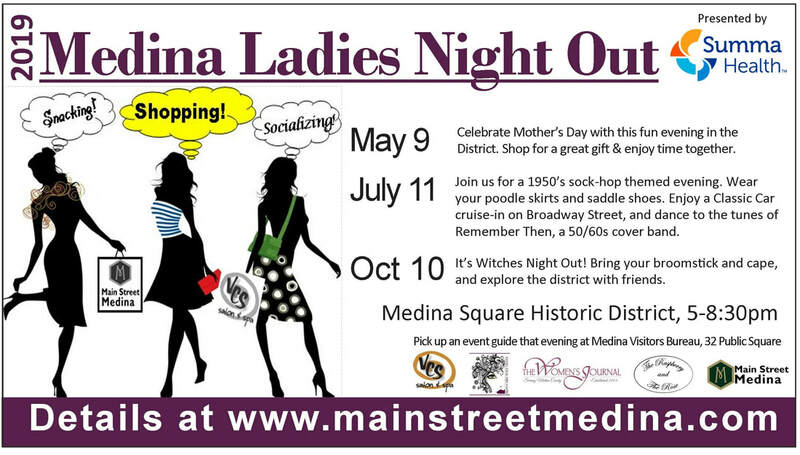 Grab the girlfriends and stroll the beautiful Medina Square for an evening of shopping, tasting, socializing, and fun. Pick up a treat bag at 32 Public Square during the event, and then go store to store to receive treats and incentives. Hit the Medina Square for hours and hours of family friendly fun, including games of chance, a summer reading kick off, a book sale, face painting, dancing, and the huge safety fair! Check out a fire truck, sit in a police car, practice on a fire extinguisher, and have a blast. Help choose the best pizza in Medina County at the annual Pizza Palooza event. Up to 8 pizzerias will compete for Judges Choice and People’s Choice of best pie in Medina. While you’re enjoying the pizza tasking, walk around the Medina Square and visit over 50 social service and non-profit groups doing good work and offering incredible support for our community. Presented by Main Street Medina, Feeding Medina County, and United Way of Medina County. Visit Medina in late August for a full day of fun, food, music, and activities, celebrating all things Medina! Medina Fest will feature local businesses, music, food, and activities unique to Medina. The four main event components include Medina Music, Medina Family activities, a Made in Medina expo, and Medina Restaurant Row. The Medina Farmers Market will also be part of the festivities. Enjoy delicious dining at local, independent restaurants and food boutiques during this special, 2-week promotion. Each restaurant features a unique dining deal or discount. Presented by Main Street Medina, Greater Medina Chamber of Commerce, and member restaurants. The holiday season kicks off November 22-24th, 2019, as Main Street Medina, the City of Medina, and title sponsor, Root Candles, presents the 35th annual Medina Candlelight Walk. This annual, three-day event, always held the weekend before Thanksgiving, features a community Christmas tree and district lighting, live choral entertainment, an outstanding Holiday Parade of Lights, fireworks, visits with Santa Claus, and great shopping, along with the Medina Holiday Farmers Market and Christkindlemarkt on Broadway Street, and a 5k Fun Run by the Medina County Road Runners. Support locally owned and operated businesses in Medina on this special, Shop Small Saturday. Shopping local means that 60-70% of dollars spent stay within your community and get reinvested in town. When you shop small, you’re supporting your neighbors, friends, and quality of life. all special events take place on the Square (2 Public Square, Medina, OH 44256) or in the Historic District unless otherwise noted.